Horrendous story on the BBC news website about Global Food Security. Apparantly 25% of all food is traded on international markets and a large amount of this is shipped through a few potentially risky waterways and inland transport networks - Panama Canal, Brazilian roads which flood etc. So this makes imported food at risk from disasters - natural and man-made, and we seem to be getting more of those all the time. It makes great sense - environmentally, socially and probably economically - to grow as much of our food as possible as close as possible to where we eat it. Saves on transport costs, provides local employment, keeps the food fresher, makes people more aware of where food comes from and how it's produced and enables us to police production standards for animal welfare and use of chemicals. I find it very strange that we buy tomatoes from Holland in the winter, when most of the UK's weather is milder than the Netherlands in winter. They grow them in green-houses - why don't we? A couple of years ago I watched a program about growing potatoes in the desert in Egypt. The farmer buys in seed potatoes from Scotland (actually sensible because the cool Scottish climate deters virus-carrying aphids) but also buys peat from Ireland to pack the potatoes for transport back to Europe - where we can buy new potatoes in March. Of course he also has to use a lot of fertilizer and get water from miles away to make the desert green with his spuds. CRAZY! I'm also horrified to see onions from Chile and Peru in the supermarkets. On what planet (maybe Mars?) does this make any economic or environmental sense? Onions grow great in UK year round and store well. Global trade can provide benefits for producers and consumers. Cash crops often enable poor communities to afford a better life. But we are at risk, not only from disasters but from the greed, or mismanagement of global corporations who have only share-price and directors salaries on their mind. Same with basic utilities - water, power and transport. We need to keep them under our control. If you have a little space or a patio or balcony you can start by growing some of your food. At Froggarts Cottage we are lucky to have lots of space for veg, a small orchard and a greenhouse. But a small space will do - yesterday I visited a friend who has just a tiny back yard he's filled with all kinds of pots and containers and growing potatoes and tomatoes all amongst the flowers. Home grown tastes much better too! The garden is beginning to provide us with its bounty. 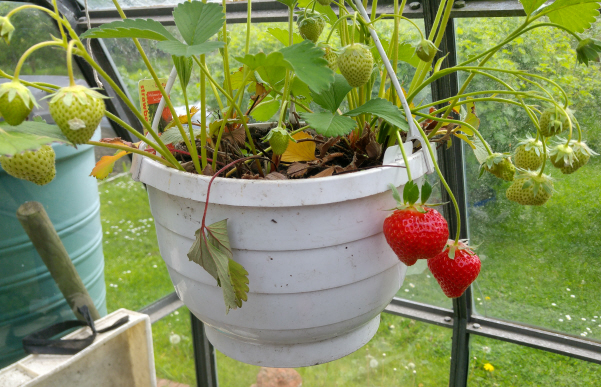 We've had a few lovely strawberries from the baskets in the greenhouse, a kilo of gooseberries, rhubarb and some chard from last year's sowing and a handful of sugar snap peas. We're looking forward to having some broad-beans in a few days and we've had a few meals from potatoes (kestrels) grown in big pots. The Elsante strawberries which we've had for 2 years produced early but have nearly finished now. We've got some more strawberries from a neighbour which are just ripening now. Don't know the variety. The spring flowers, like aquilegias, bergenias, bistorts have mostly gone over now leaving heads of dead flowers - which are turning into nice, ripe seeds. 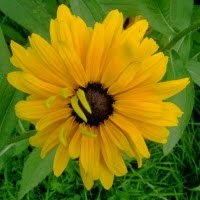 The general view of gardening is to dead-head to preserve the strength of the plant for next year and to tidy up. But don't be too hasty - seed heads provide a great food source for birds, especially needed at this time of year to feed hungry youngsters and second broods. The goldfinches are nesting in a neighbour's conifer.